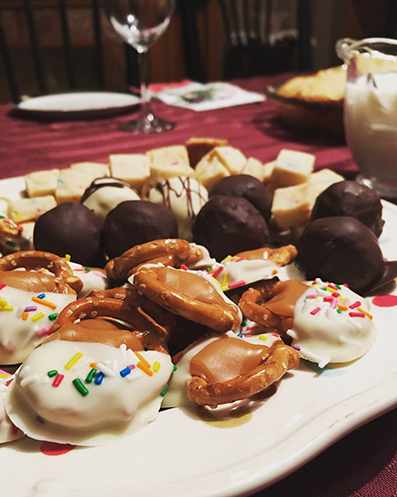 ‘Tis the time of year for the holiday crafting post, after all the gifts are gifted :D But I always lose track of what I made… here are some highlights! 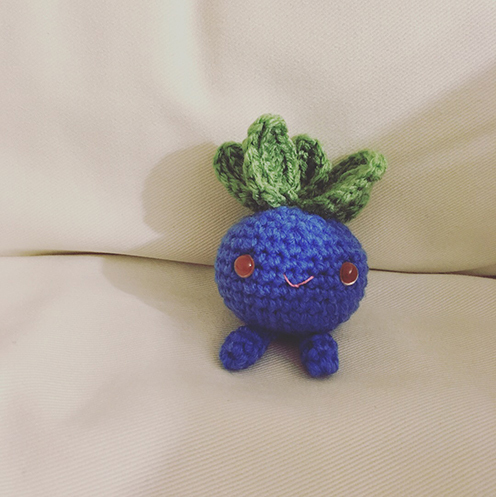 Here’s Oddish chilling on the couch. 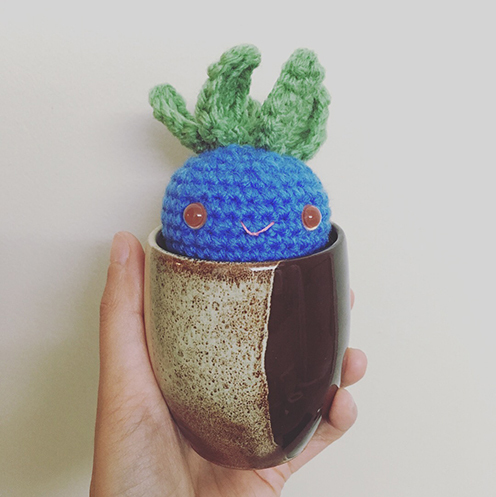 I’m really happy with how Oddish turned out. 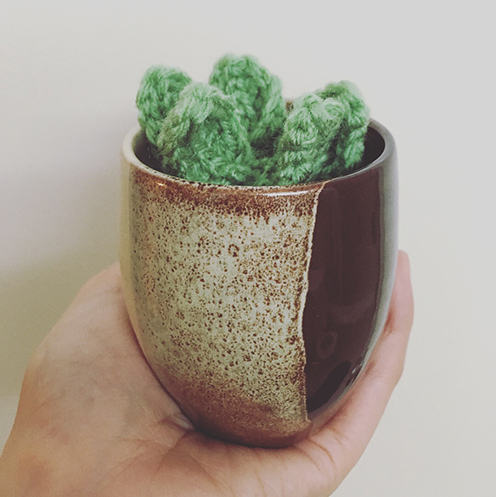 There are a few good Oddish patterns out there but I ended up making it up as I crocheted because of the size of the plant pot. I also got a pair of reddish brown safety eyes as part of a free gift one time from a crochet magazine subscription :D They worked perfectly on Oddish. 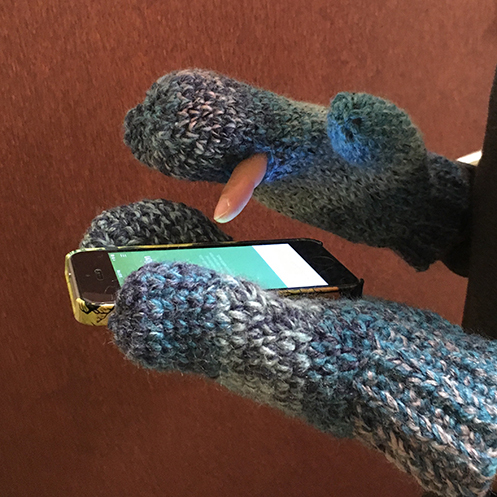 It has finger openings for texting and taking pictures! :D I made them from this lovely pattern. But well worth the time! Look how happy my dad is! :D And it fits perfectly! 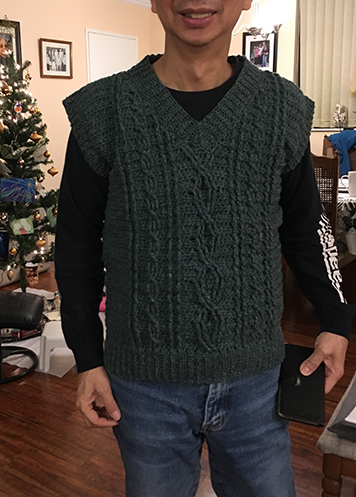 Always tricky making garments for my parents, never know if it’s going to fit and I can’t get Mike to test try it because he’s much taller… but it worked out this time :D The cable pattern is actually taken from this sweater pattern. 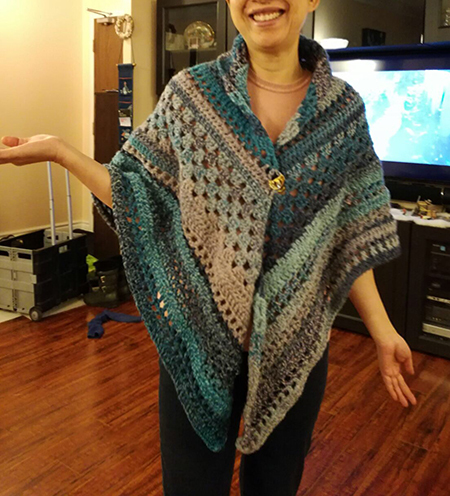 This is my mom doing a dance with the crochet shawl, probably to the music on TV (my sister sent me the photo :D). I thought it would be good for when she studies and writes in her office at home, which she spends quite a bit of time doing. 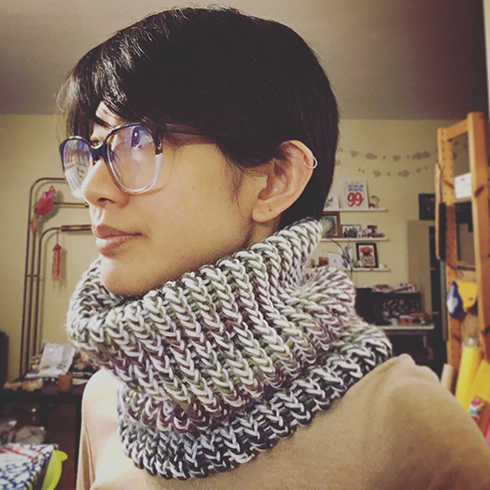 It’s modified from this gorgeous pattern, because I was using a much heavier yarn. I skipped over quite a bit of the granny stitch sections. 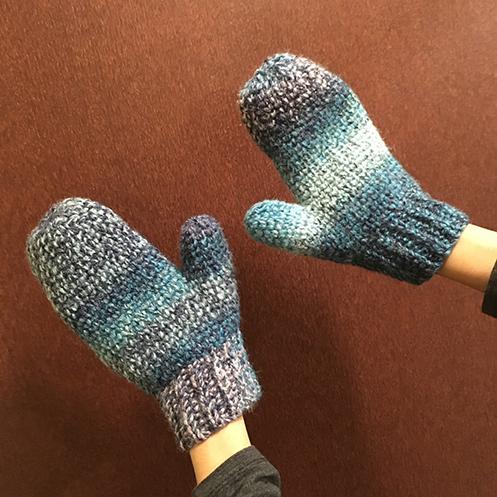 It’s a fun pattern to make with variegated yarn with long colour changes. Isn’t it magnificent? :D Very grateful heart and stomach. Here’s to a year of new ideas and more crafting! 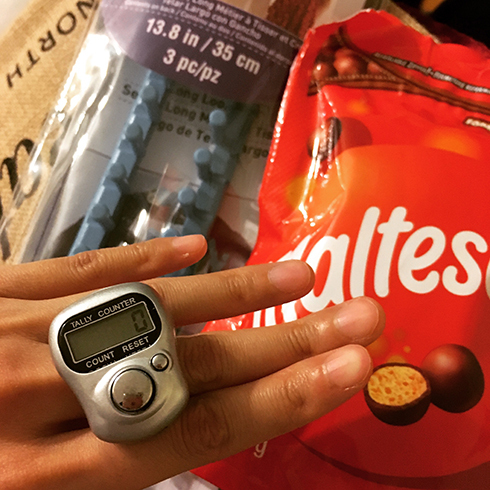 I absolutely enjoy seeing the many projects that you create, so lovely, some very quirky: so inspirational. Thank you for sharing. I wish you an incredibly productive year and much happiness. belated MERRY CHRISTMAS & HAPPY NEW YEAR! thank you so much Patricia! looking forward to sharing more projects in 2018! :D happy new year to you too! Je reste sans voix devant tous vos ouvrages, tous plus jolis les uns que les autres. J’aime tout : le petit cactus, le très beau châle, les ingénieuses moufles…et tout le reste! !Merci pour ce joli post. 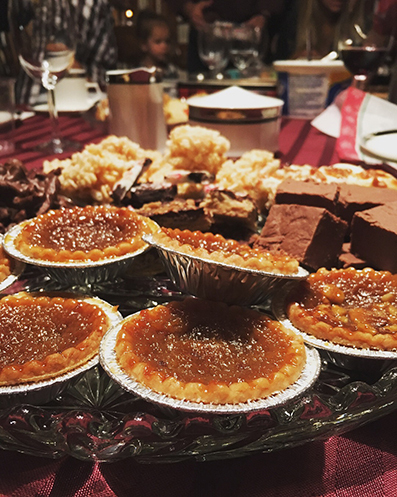 thank you so much Claudine! hope your new year is filled with joy and creativity! thank you so much for your kind words over the past year! I believe Ma sent the picture herself…she got Ba to take it for her. That Oddish is adorable! I’m a Pokemon fan (Level 23!) and I’ve often thought a crocheted Pokedex would be just the thing. Happy New Year to my favorite blogger.